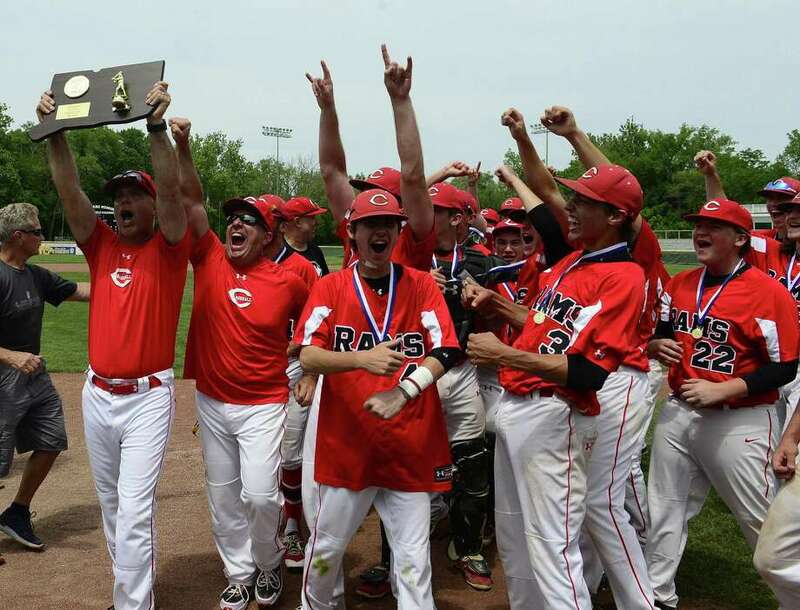 Cheshire coach Bill Mrowka holds up the championship plaque as the Rams celebrate winning the CIAC Class LL championship 1-0 over Ridgefield on Saturday at Palmer Field in Middletown. The Cheshire baseball players gathered around the championship plaque and pointed their fingers skyward letting everyone know they are No. 1. The Rams are not only the newly minted CIAC Class LL state champions, they also close the season as the No. 1 ranked team in the GametimeCT poll. There should be no debate. The No. 4 seed completed a run through the LL tournament by defeating Ridgefield 1-0 in the championship game Saturday afternoon at Palmer Field in Middletown. Winning pitcher Ben DeLaubell tossed a complete game and also drove in the winning run on a groundout to second in the top of the seventh inning. To reach the final, the Rams had to get through defending champions No. 5 Staples (4-3) in the quarterfinals and the No.1 team in the state entering the tournament, Fairfield Prep (5-4), in the semifinals. Cheshire closes the season 20-4 and with the first state championship for the school since 1993. Rams coach Bill Mrowka thinks his team has earned the No. 1 ranking. Once Windsor (22-3) lost to Wethesfield in the Class L championship Friday, it was clear to most the Cheshire-Ridgefield winner would likely be the state’s top team. That was further confirmed when Wolcott (21-4) lost to Seymour 13-2 in the Class M final, with the thought being some No. 1 votes may have gone the way of the Eagles.